Mr. Tony Giles, age 40, is a blind-deaf independent traveller. He has been to 140 countries travelling solo, making Eritrea his 140thdestination. Mr. Giles has put out two books, several documentaries, countless pod casts and has given countless interviews to big media centers regarding his travels. He spoke to Raffael Giuseppe of ERITV during his stay in Eritrea for his very first interview in Africa. Q&A presents you with extracts of it. 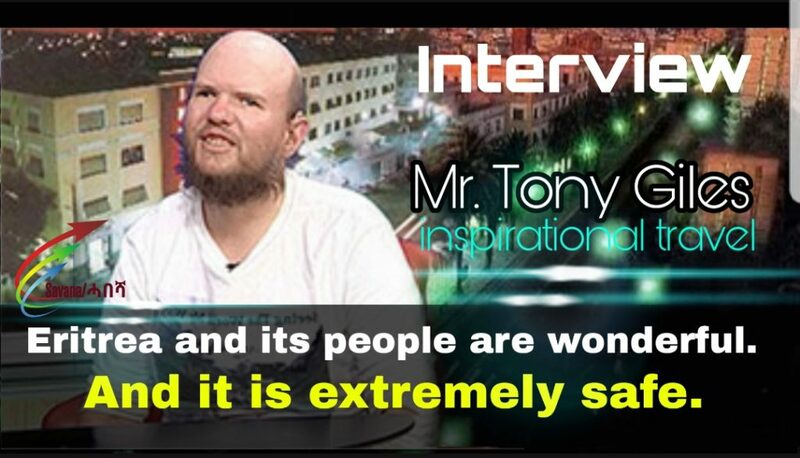 –Thank you for your time Tony and welcome to Eritrea! Can you tell us a bit about yourself? My name is Tony Giles and I am from South West England, UK. I was born with a very rare eye condition. Basically, I don’t have some of the nerves that we use to see. I don’t see any color, but I could see black and white images. So, I did have the cells that the human eye uses when a person gets in a dark room like a cinema. I was very sensitive as a baby. I spent the first three years of my life in the dark. And then I was given dark glasses and only then could I go out to play with my friends. I learned my alphabets with very, very large letters written on black paper. That is how my eyes sensed the contrast. However, as I got older, my sensitivity to light changed and I faced nerve damage. Moreover, as I got older my hearing got worse and worse and I lost my hearing. –You have travelled to 139 countries so far making Eritrea your 140th destination. Why do you travel in your condition? Isn’t it hard? How do you do it? Travelling is the biggest challenge I can face. When I was a child my father told me about his adventures in the merchant navy. He went all over the world with his crew. Hearing all about my father’s adventures at the age of six stimulated my imagination. When I turned ten I went to a special boarding school for the blind and partially sighted children. It was a long way from home and because I wanted to go back home and visit my family as much as possible I was given mobility training — to use a long cane and to get around without problems. So my teachers taught me how to be independent from a young age. Many people go to places to visit and see things, but being blind, obviously, I don’t have that so it is more about the sound, the smell, eating different foods, meeting new people and learning about their cultures. Personally, I like to visit historical sights, churches, mosques and architectures. I normally get a guide to show me around and describe the architecture to me. I have done the same in Eritrea. When you are blind you are not distracted by the visuals. My brain is so active and conditioned to notice much more than that of those with visual perceptions. So that is why I love to travel. When I am walking around or climbing mountains I can feel the different terrains under my feet. I also notice the energy in my surroundings. No matter where I am I can detect with my skin spaces, the wind, sounds and much more. -Do you face difficulties commuting from place to place in big cities? It is actually easier commuting in big cities, New York, for example. It is easy to get around because big cities are built on good systems. I get a mental picture of where I am going and I count the blocks. Likewise, in London I often use the subway and I can hear the announcements. But most importantly, the people’s help is extremely helpful no matter where I go. Travelling is complicated for most people. And I understand a lot of people might feel that travelling is even harder for a blind person but it is actually very simple. You do your research, plan ahead of your travel and imagine your surroundings. -But you are also 80% deaf; is it still simple? I am 80% deaf in both ears. It gets more difficult without my digital hearing aid. Without them I face trouble understanding accents or background noises. Deafness is more difficult than blindness. Because my blindness doesn’t change, but my hearing changes depending on situations. -It is amazing that you have your own way of traveling. Like the title of your book says you see “the world your way”. It is astonishing where you have reached replacing your sight. Honestly, I never had sight so I didn’t replace it. The sight I had when I was a child was not really ‘seeing’. It was more of ‘sensing the contrast of black and white’. So I didn’t replace much. For me not seeing is very natural. Likewise, wanting to travel was a natural progress. Growing up in the UK, my teachers used to tell me that I would be able to do things and visit places. I was given that confidence that got me to be the person I am today. Disabled or not, people need to find confidence in themselves. –What excites you most about travelling? Meeting people has been great for me. I travel very economically; I go to hostels and meet people like me, people who like to travel. We make connections and go to places together. -What was travelling solo like at first? When I first started out travelling I went to places that have similar characteristics with the UK. Places like Australia and America where people speak the same language as me and places I have learned and heard so much about in school. Much later, when I gained enough confidence to travel around, I said, ‘alright, let’s go to new places’. I wanted to challenge myself. So, I started going to places like Vietnam or Thailand where I am new to the places and where people speak very little English. –What makes you trust people? I don’t know if I was born with it but I do have faith in people. I can’t explain it. I know, some people would try to take advantage but it doesn’t mean anything because I did face similar situations even in my own country, but I held to my inner feeling that people would help me. Now, I have been travelling for twenty one years and I did face some occasional difficulties, but the kindness and generosity I have been receiving from complete strangers from all over the world is really overwhelming. I feel privileged. Travelling did get hard in some countries for reasons of security. In some places I had to pay extra to get my passport back; mostly, in African and South American countries. People get advantage of you. But for me it is a challenge. You never know who you might meet and what relationships might blossom from those instances. That is travelling! -And what has it been like to travel in Eritrea? Has it been safe? Yes it has. I have read a lot about Eritrea. And Eritrea has a beautiful geography and terrain, also, very versatile. It has got mountains, coastlines, islands… basically, a little bit of everything. The Eritrean towns and cities are fascinating. I also wanted to meet the people and experience the culture. The people are very kind and generous. They are also very shy… humble. And the food is good. I love enjera! Walking around Asmara, obviously, I am not seeing the Italian architecture which the city is really famous for, but I am feeling the warm sunshine, I smell the aroma of coffee and flowers. In the countryside the breath is fresh and light. Coffee is everywhere! I went to Massawa and I was able to touch some of the architecture made with corals. That is fascinating because buildings in Asmara are made of bricks and stones but in Massawa you can find buildings made of corals! I smelled the sea, walked on the beach and enjoyed the sea food. In Keren, which is probably my favorite place in Eritrea, just walking around in the evening has a buzz about it. The atmosphere is so lovely. People, in the evening, are out getting their coffee and dining on the roadsides… it is so nice. I went to the camel market and that was so interesting. Keren is very mountainous, so in the edges of the town a couple of climbs are very appealing. I would like to go to the volcanoes, the green belt and Nakfa next time I come. Eritrea and its people are wonderful. For a blind person there are so many opportunities in Eritrea. And it is extremely safe. -What do you mean by “Seeing the World my way”? And, on the way, tell us a bit about your books. That is the title of my first book. I see the world differently. For me it is about the smell, the food I experience, the ground I walk on, the conversations I make and the cultures I learn about from the people themselves. The way I see my world is exhilarating! When you are blind you need to feel things and have things being described for you. That is the best way of experiencing the world! As for my book, I have published two books so far. My mother gave me the idea of writing for my friends. But then the response I got from people encouraged me to share my story and inspire people with disabilities. I want to tell people that life is full of opportunities. My first book depicts the young me, drinking and partying. I wrote my second book after I quit drinking for health issues and there I explain how I saw myself and the world. It is more emotional. Living life as a young blind and deaf person is what my second book is about. –We want your courage to be an inspiration to young Eritreans with disabilities. Do you have any messages for them? Don’t be afraid. You can achieve whatever you want. Take one day at a time and don’t hesitate to ask for help. Most importantly, don’t let people set a limit to your imagination. Say ‘I can’ and give it a go. Believe in yourself. If I can travel the world and I am blind and deaf, what can you not do? Good luck! –Thank you Tony! We admire you.